Welcome and thank you for your interest in this Very Classy, Very Efficient, and Very Unique! Quilt Design Wall /Shade. Made for all Quilters by a Quilter. 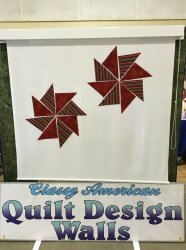 After my mother Judy, www.judyssewingcenter.com came up with the idea, it took approximately 1 year of Designing & Redesigning to make Mom Happy, and after selling out at most all of the major Quilt Shows in the western United States Including Huston, Chicago, and of course PQIF Mancusso, Santa Clara. We make them for you with a 30 day 100% risk-free customer satisfaction money Back Guarantee. Visit our sister company www.quiltingonline.shop for all your Quilting needs.